1. I am definitely listening to the Ghostbusters theme right now. Not only am I not ashamed to admit this; I'm THRILLED to announce it. 2. The overriding question of the day is this: How does one acquire THIS MANY PILLOWS?!? What did I think I was going to need them for? When the Zombie Apocalypse begins, I will be hiding in my house barricaded in with my pillows. They will never find me. And even if they do, I say BRING IT ON, ZOMBIES... I'm ready. 3. This photo is not from today. I assure you. But I'm not kidding about the Apocalypse. I think the pillows are going to be key. 4. I spent most of my day packing and then on hold with both the CT and NY Departments of Labor. If you ever want to get an idea of how our government works, make a call to both of these places and ask them to figure something out for you. Good luck. NY hung up on me because the guy I got couldn't speak English and I asked him to repeat the number NINE at least four times. 6. In case you haven't noticed, I'm tossing around the idea of chronicling all of my shenanigans on this blog just like I used to do when I was unemployed in 2008/2009. It makes for good material. And let's face it, besides being on hold all day with various Departments of Labor, there's not a whole hell of a lot going on. 8. What if I promise to make it funny? 9. I can't promise much right now, but I can promise funny. 10. That pillow photo that I posted... 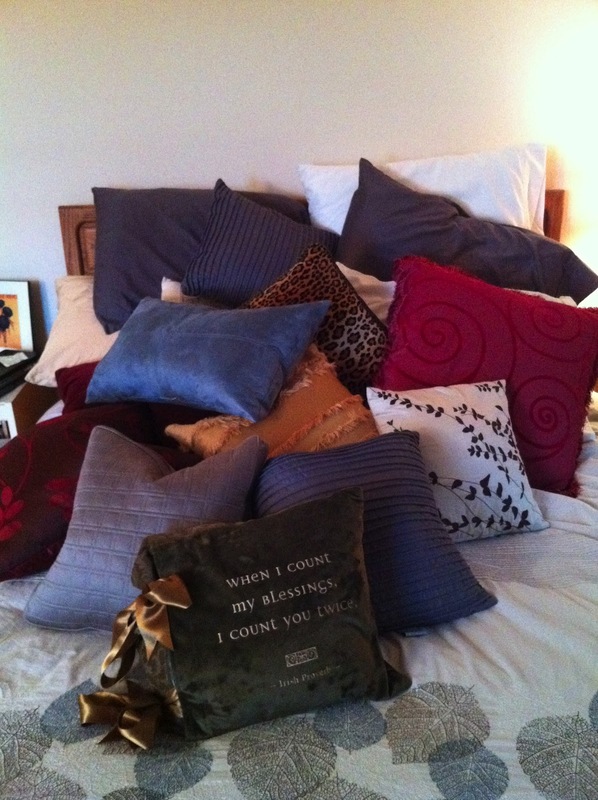 There are more pillows than that in this house. I just can't show all of them because I don't want the zombies to know what they're up against. Yet.